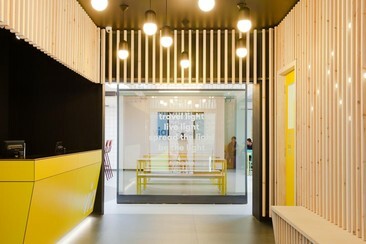 The Dictionary Hostel is Hackney's original youth hostel. 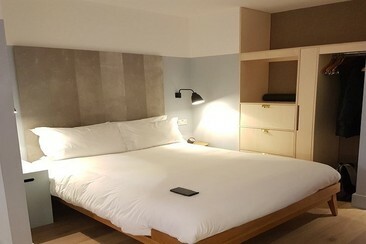 Located in Shoreditch, East London, it is the perfect place for travellers and backpackers looking for a unique and fun place to stay. The hostel features large and small dormitories, as well as private rooms, all of which are equipped with a variety of amenities including en-suite bathroom facilities for most rooms. The hostel bar has a vibrant atmosphere, and serves tea, coffee, pastries, and hot meals. Guests are free to relax and socialise in the lounge, roof terrace, or courtyard. A free continental breakfast is available each morning. 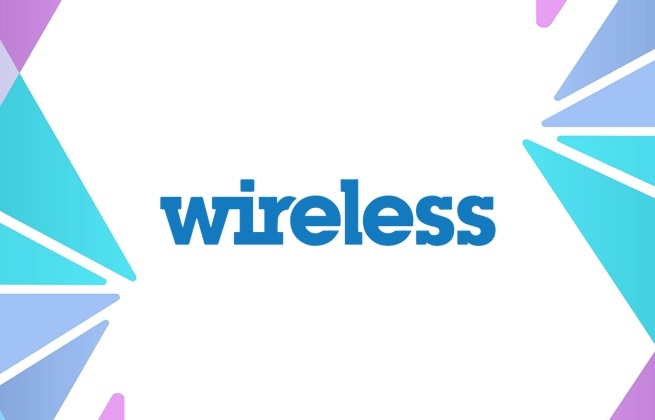 Other hostel facilities include free Wi-Fi in the lounge, a self-catering kitchen, laundry services, a bar, a café, a luggage room, and a coffee shop. The Dictionary Hostel is situated close to public transport links to Central London, with Old Street Station a 12-minute walk away. 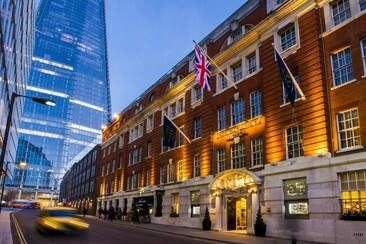 Shoreditch's eclectic mix of pubs and resturants are easily accessible, and Oxford Street is a 20-minute bus ride away. 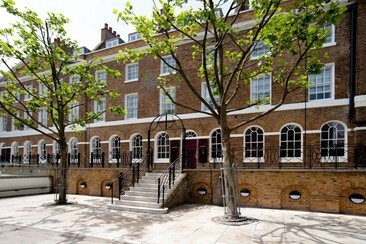 Via Limehouse (zone 2) puts you right in London’s dynamic East End. It’s less than 2 minutes’ walk to the London Underground station of Limehouse DLR that takes you 5 minutes to Tower Gateway for the Tower of London, or Bank, for a direct route to the heart of London. Less than 10 minutes’ walk away is the must-see business district of Canary Wharf. The dormitories offer either a private en-suite bathroom or a shared bathroom. The dormitories feature bunk-beds, a twin / double room is also available. Guests are able to make use of the shared lounge and TV area. There are lockers and vending machines on-site. 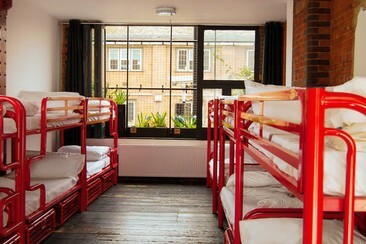 The hostel offers a 24-hour front desk and free WiFi throughout. The Leman Locke is located in the heart of London's creative hub, just a few minutes from Tower Bridge, Spitalfields and Brick Lane. More conveniently, it's only a 15-minute drive from the property to London City Airport. 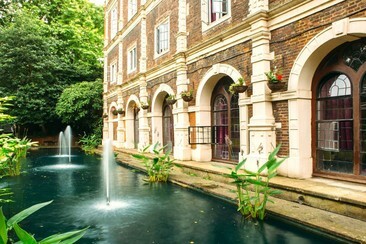 Each of Locke’s 168 apartments has been meticulously designed to give guests senses of space and style. They feature big windows, Locke Dream Beds, L-shaped sofas, smart TVs, super fast free WiFi, loads of storage space, fully equipped kitchens and bathrooms. While staying at Leman Locke, you can enjoy an ever-changing menu specializing in clean beautiful food at Treves restaurant, visit the downstairs Hyde coffee shop for things like hand-crafted sandwiches during the day and cocktails at night, or head to one of the neighborhood international supermarkets or organic food shops and then release your inner chef in the kitchen. What's more, Leman Locke's gym, wellness programme, Kinsey Apothecary and yoga club are certainly worth a discovery. 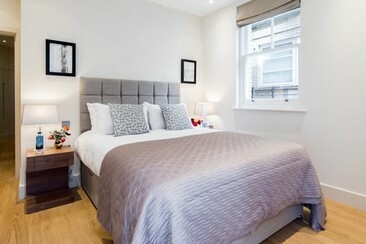 Sweet Fitzrovia I vacation apartment surrounds you with British charm. In this lively neighbourhood, made famous by poets, musicians, and dreamers, you’ll find authentic restaurants and fabulous art galleries. Stroll around the world-famous Regent’s Park (10 min. walk) or take in a stunning exhibit at the Wallace Collection (13 min). Bars, cafes, and bookshops line the streets; a bus stop is right outside the apartment, and the Great Portland Street tube station is 8 minutes’ walk away. With clean white walls and huge windows, our local interior designer has created a simple, soothing space. Cushy furniture and whimsical patterns make this apartment feel like home. A fully equipped kitchen gives you everything you need for an in-house feast. Premium amenities include free WiFi, cable TV, luxury toiletries, hotel beds and linens, and a Nespresso machine. 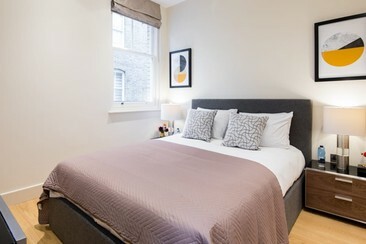 Fitzrovia Garden II vacation apartment puts you in the heart of London’s bohemian Fitzrovia neighbourhood. Here, you’ll find authentic restaurants, fabulous art galleries, and offbeat boutiques in vintage brick buildings. Stroll around the world-famous Regent’s Park (10 min. walk) or take in a stunning exhibit at the Wallace Collection (13 min). Bars, cafes, and bookshops line the streets; a bus stop is right outside the apartment, and the Great Portland Street tube station is 8 minutes’ walk away. With huge picture windows, understated colours, and sophisticated wooden floors, our local interior designer has created a classic English retreat. Cheeky patterned upholstery and cushy furniture make this apartment feel like home. A fully equipped kitchen gives you everything you need for an in-house feast. Premium amenities include free WiFi, cable TV, luxury toiletries, hotel beds and linens, and a Nespresso machine. 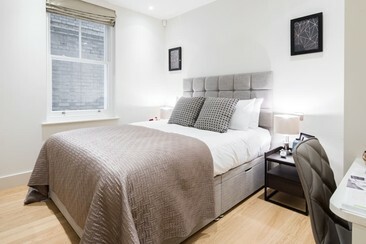 Sweet Fitzrovia IV vacation apartment surrounds you with British charm. In this lively neighbourhood, made famous by poets, musicians, and dreamers, you’ll find authentic restaurants and fabulous art galleries. Stroll around the world-famous Regent’s Park (10 min. walk) or take in a stunning exhibit at the Wallace Collection (13 min). Bars, cafes, and bookshops line the streets; a bus stop is right outside the apartment, and the Great Portland Street tube station is 8 minutes’ walk away. With clean white walls and huge windows, our local interior designer has created a simple, soothing space. Cushy furniture and whimsical patterns make this apartment feel like home. A fully equipped kitchen gives you everything you need for an in-house feast. Premium amenities include free WiFi, cable TV, luxury toiletries, hotel beds and linens, and a Nespresso machine. 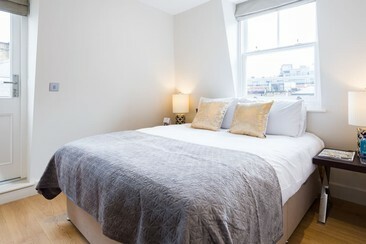 Fitzrovia Terrace II vacation apartment immerses you in British charm. In this lively neighbourhood, made famous by poets, musicians, and dreamers, you’ll find authentic restaurants and fabulous art galleries. Stroll around the world-famous Regent’s Park (10 min. walk) or take in a stunning exhibit at the Wallace Collection (13 min). Bars, cafes, and bookshops line the streets; a bus stop is right outside the apartment, and the Great Portland Street tube station is 8 minutes’ walk away. This sleek apartment has been decorated by our local interior designer to make you feel at home. A huge loft-style picture window lights up the living room, and London-themed wall art brings the city indoors. The fully equipped kitchen has everything you need for an in-house feast. A cosy balcony overlooks the neighbourhood’s quaint brick buildings. Premium amenities include free WiFi, cable TV, hotel beds and linens, luxury toiletries, and a Nespresso machine. 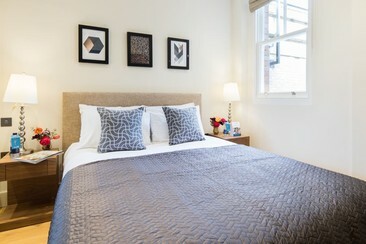 Heart of Fitzrovia I vacation apartment surrounds you with British charm. In this lively neighbourhood, made famous by poets, musicians, and dreamers, you’ll find authentic restaurants and fabulous art galleries. Stroll around the world-famous Regent’s Park (10 min. walk) or take in a stunning exhibit at the Wallace Collection (13 min). Bars, cafes, and bookshops line the streets; a bus stop is right outside the apartment, and the Great Portland Street tube station is 8 minutes’ walk away. Spacious and sunlit, this apartment has been decorated by our local interior designer to make you feel at home. Two cushy bedrooms will lull you to sleep, and a fully equipped kitchen has everything you need for an in-house feast. A cosy balcony, overlooking the neighbourhood’s quaint brick buildings, brings London scenery straight to you. Premium amenities include free WiFi, cable TV, hotel beds and linens, luxury toiletries, and a Nespresso machine. Enjoy real convenience - travel direct to the festival’s own on-site coach station, just next to the festival gates. Return in comfort - book your journey to and from the festival at times that suit you.